Hitchcock’s masterpiece was given a controversial restoration for a theatrical re-release in 1996. 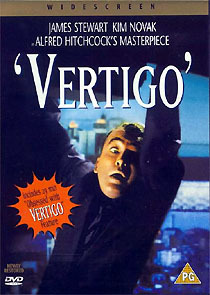 The restoration process is detailed in a half-hour documentary on the disc, Obsessed With Vertigo, and is also discussed on the disc's commentary track. Great effort was made to clean up the picture – with generally very satisfying results (a few especially processed special effects shots are conspicuously grainy), but somewhere down the line someone decided that new replacement sound effects should be created so that Bernard Herrmann’s beautifully hypnotic score could be presented in 5.1 digital stereo. The score sounds exquisite, but purists have paid heavily for the privilege. Sadly no-one thought to include the original soundtrack on the DVD, which would have satisfied everyone. The good news is that Universal’s new Region 2 disc contains all the supplements that are on the R1 Collector’s Edition (including a couple of trailers) and, as a significant bonus, the UK disc is presented in 16:9-enhanced widescreen (1.85:1).